It's election day and there are some critical races that we are keeping an eye on here at the UP. Watch for the media to start the narrative based on how the results turn out as to how the Democrats will fare in the Midterms Elections in November. 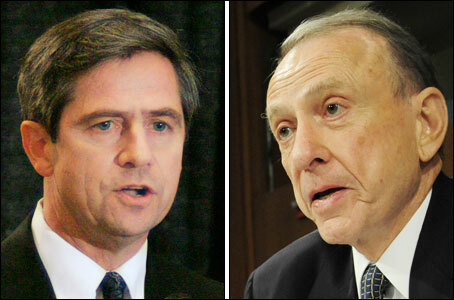 Pennsylvania Democratic Primary - Republican Democratic Senator Arlen Specter vs. Congressman Joe Sestak (pictured top left). Key Take Away: Specter is on the ropes. He was a Republican Senator for 30 or so years and even was the person responsible for the famous Magic Bullet theory of the Kennedy assassination. Whoever wins this race will face SUPER Conservative Pat Toomey who is funded by Club for Growth (read: he's WAY WAY WAY over there to the right). If PA voters want someone sane, no matter who they select today, they will have to mobilize once again in November against a Republican Tea Party electorate who is pissed off and motivated. 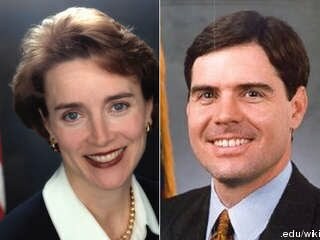 Bottom line is that even though President Obama and the White House are publicly supporting Specter, they are also keeping their distance in case Sestak pulls out the victory today. It will be interesting to see if Democratic primary voters can ignore the fact that Specter was a Republican for 30 years and only switched because he had no shot in winning a Republican primary against Toomey. Arkansas Democratic Primary - Senator Blanche Lincoln vs. Arkansas Lieutenant Governor Bill Halter (pictured center left). Key Take Away: Lincoln is not only facing the anti-incumbent fever, she's also been singled out by the LEFT as a key barrier to getting the public option during the health care fight (REMEMBER THAT!?). Halter used the anger on the left to launch his candidacy and received a flood of cash as soon as he announced he was entering the race. It is possible to make the argument that Lincoln would have had a tough time even if she had not blocked the public option because pollsters agree that the desire to kick out incumbents is at the highest level in years. UPDATE: Senator Lincoln turned away from home polling place this morning! Wow....that's an EPIC TOTAL COMPLETE AND UTTER FAIL. Can the Tea Party Movement Go Mainstream? 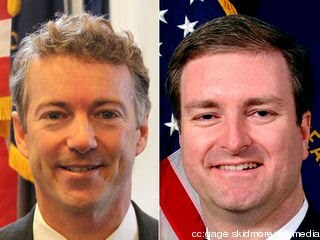 Kentucky Republican Primary - Dr. Rand Paul (son of Texas Congressman Ron Paul) vs. Kentucky Secretary of State Trey Grayson (pictured bottom right). Key Take Away: This is the TEA PARTY race. 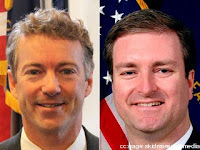 If Paul pulls off the upset here, the Tea Party will claim they have electoral mojo and are living up to all the hype. If he is defeated, well I guess they can go back to making misspelled signs about Obama being Hitler's 3rd cousin. Rand Paul is an interesting candidate because despite having no support from the Republican establishment, he is leading comfortably in the polls. Check back throughout the day for more updates on the status of these races!